Mark your calender on March 31, 2012. Mike Rogers, the Founder of Grind for Life, Inc is calling you to go to Fort Lauderdale for his skatepark series contest #2. 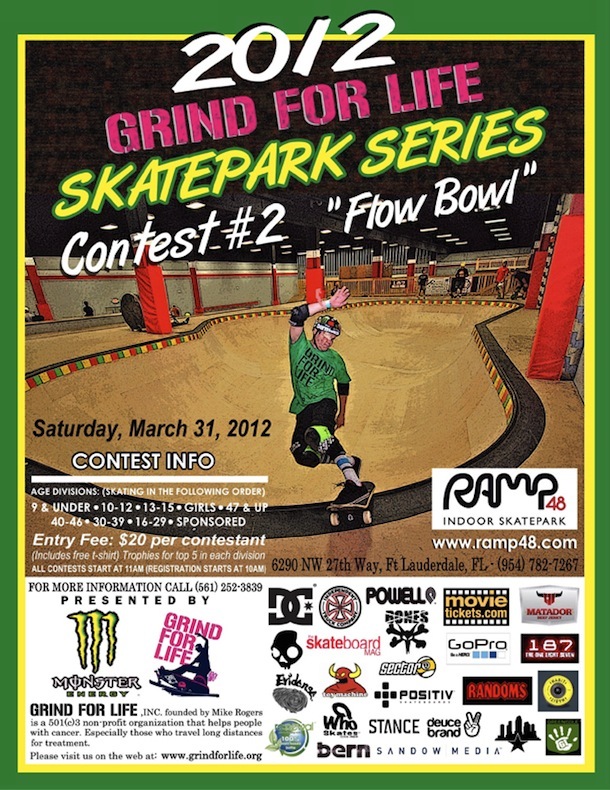 Yes, it's a flow bowl and the entry is $20 per contestant. Grind For Life, Inc was founded in 2003, by life-long skateboarder Mike Rogers, after his second battle with sarcoma cancer. Mike's tumor was located behind his right eye and nasal cavity. He endured a 17 hour surgery a cranial-facial resection with a brain-lift, removal of his eye, cheekbone, and half of the roof of his mouth and some of his teeth. He beat cancer once as a pre-teen, and again 25 years later. Mike beat the odds and is skateboarding competitive again.